"Through the Woods" Emily Carroll, 2014. 208 pages softcover graphic novel, Margaret K. McElderry Books. Even though "Through the Woods" was published in 2014, it didn't come onto my radar until about a recently. 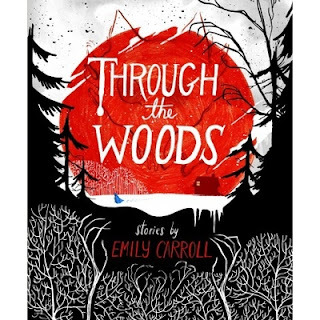 This graphic novel by Emily Carroll is perfect for this time of year, as the horror stories wind their way through woods in fall and winter. Horror stories are hit and miss with me, either they're not scary enough or they're too gory, not leaving enough to the imagination. Carroll finds the perfect balance of suspense and blood in this volume, and I absolutely loved it. "Through the Woods" is an anthology of seven short stories, with the first and last being a very short introduction and conclusion. All of the stories are set in the past, with only one (the longest) being set in the twentieth century. That said, the really terrifying stories seem to be timeless. Poe set most of his tales in the past, but still chill us today. "The Shining" was made in 1980, but still scares the hell out of me. Carroll's stories are similarly timeless. They're unnerving, they're disgusting, they're truly terrifying. But you know, with pictures and stuff. Carroll's illustration style reminds me of Kate Beaton, with very two-dimensional figures inhabiting settings that tend towards the abstract. Most remarkable is her use of light and darkness, with many pages entirely black save a character being consumed by darkness. The word balloons are also used stylistically, with streams of words sighing from ghosts or screams being pulled from the living. They kind of remind of me political cartoons from the 1700s - 1800s, but that's probably my history teacher showing. It's different from what we usually see in comics and graphic novels. I dig it. If you grew up reading "Scary Stories to Tell in the Dark," this will remind you of that. Even though these are short stories, they'll stick with you. Perfect in time for Halloween -- but do some pre-reading to see if they'd be appropriate for the age of students you teach. If you're already teaching something a little bit eerie, some Poe, some James, some Seuss, some Dahl, some urban legends, some folklore, some cryptozoology, this could liven up the mix.